Yes, I know. It says right in the tag line, "No self-help" and yet here it is. Even worse, I can't believe that not only did I listened to the whole thing but I even went as far as checking out the price of the print edition. There are some quotes and some lists that I would like to have in front of me for future reference. I will also say that just because I was checking out the price does mean I am telling you to go out and buy this book. I'm not. I still don't like self-help books--and that's why this isn't a review and I haven't given it any gold stars. So, why did I buy it, besides the very cheap price and because I liked the title? 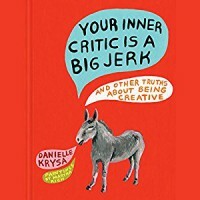 Because I started to paint four years ago and wanted see if the author had anything helpful to say about the creative process and making art. The answer is yes, she does.